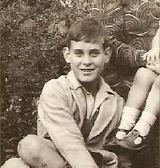 Leslie Hodges was born in Towersey on 12 September 1918 the son of Charles Edward and Charlotte Elizabeth Hodges (nee Stow) who were originally from Surrey but lived for a while at 53 Chinnor Road, Thame. He was the third youngest of twelve children, the last three being born in Thame. By 1939 his parents had moved to live in Banbury. 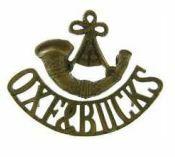 The 1st Battalion Oxford & Bucks Light Infantry was brought up to strength following the losses at Dunkirk and served initially in Northern Ireland. In 1942 they were brought back to England and in 1943 started to train for the forthcoming invasion of Europe. The 1st Battalion landed in Normandy on 24th June 1944, and the following day took part in “Operation Epsom”, which was intended to take the town of Caen. It proved to be a formidable town to capture and was unsuccessful. The 1st Oxford & Bucks moved to positions around the Odon bridgehead where it suffered from heavy German artillery fire. Leslie was killed on 8th July 1944 the day before the first Allied troops entered the town. 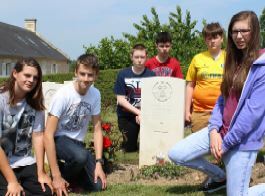 5382328 Private Leslie Hodges, Oxford & Bucks Light Infantry, is buried at Brouay War Cemetery, Calvados, France. He is remembered in Thame on the war memorial and on St Mary’s church memorial board.